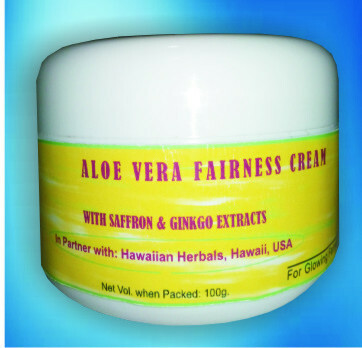 Aloe Vera Fairness Cream is manufactured and marketed by Kai German Products, an ISO 9001:2008 certified company, in partnership with Hawaiian Herbals, Hawaii USA. It is HALAL and Kosher certified product and has been produced under international GMP regulations. Aloe vera fairness cream can leave your face feeling wonderfully soft and glowing each time you use. It is blend of aloe vera, saffron, ginkgo biloba and many more which may work together to nourish and provide exceptional antioxidant protection. It is gentle formula for healthy skin and glowing fairness, dermatologically tested, and suitable for all skin types. Clean the face with face wash. Apply all over the face and neck in circular motion. For better results apply twice a day. Aloe Vera Antiaging Cream is manufactured and marketed by Kai German Products, an ISO 9001:2008 certified company, in partnership with Hawaiian Herbals, Hawaii USA. It is HALAL and Kosher certified product and has been produced under international GMP regulations. It is a 100% natural product that may help to reduce appearance of wrinkles, revitalize your skin, diminish darkening under eyes, stimulate renewal of skin cells, improve skins firmness and elasticity, and protect skin from future signs of aging.. It is blend of aloe vera, Pine bark and White tea extract which may work together to nourish and provide exceptional antioxidant protection. It is gentle formula for healthy skin and glowing fairness, dermatologically tested, and suitable for all skin types. Skin concerns, such as discoloration, dullness, blotchiness and dryness can come from a number of different sources. Kai All in one B.B. Cream immediately and effectively fulfills your skincare expectations that combine intense moisturizing skincare + immediate skin perfecting coverage for skin that looks naturally more even, radiant and smooth. All-In-One BB cream is manufactured and marketed by Kai German Products, an ISO 9001:2008 certified company, in partnership with Hawaiian Herbals, Hawaii USA. It is HALAL and Kosher certified product and has been produced under international GMP regulations. It’s a new idea in skincare. B.B. Cream (Beauty Balm Cream) is a hybrid formula that offers advanced skincare + immediate skin perfecting coverage in one single beauty product. It is enriched with, Almond extract, Aloe vera, Rose, Ginkgo biloba and many more which may work together to nourish and provide exceptional antioxidant protection. It is gentle formula for healthy skin and glowing fairness, dermatologically tested, and suitable for all skin types. · It contains powerful antioxidant complex that helps banish the effects of environmental damage, leaving the skin around the eye area vibrant and refreshed. Gently massage Under Eye Cream into the delicate area beneath the eyes after thorough cleansing. For best results use it twice daily. Kai Acne-n-Pimple Cream designed and formulated by Kai German Products as ISO 9001:2008 certified company, treats pimples and skin eruptions, heals infection while keeping the skin soft and smooth. It has excellent astringent, styptic and cooling properties derived from the goodness of Lentil, Silk Cotton Tree and Five-leaved Chaste Tree extracts, Barbados Aloe and Alum. It has astringent, cooling and anti-inflammatory properties help in reducing inflammation associated with acne. It has astringent and cooling properties, which are beneficial in treating acne and skin eruptions. It is an effective astringent, styptic and antiseptic. It is beneficial in superficial infections, prickly heat, acne and ulcers. It possesses emollient, astringent, cooling and healing properties and is widely used in creams, lotions and shampoos. It is effective in treating skin disorders such as acne, sunburns, bruises and dermatitis. It has anti-inflammatory, antibacterial and antifungal properties. It is useful in treating sores and skin infections. Wash or cleanse face and apply a small quantity of Acne-n-Pimple Cream over the affected areas twice daily. Use regularly for best results. Kai Herbal Fairness Cream is enriched with wonderful herbal ingredients can gently lighten skin, clears spots and gives you fairness with an even tone. It gives beautiful and healthy complexion. Skin can become smooth, supple, flawless and radiant. It is well recognized for its soothing and conditioning properties. It promotes the removal of dead cells and replenishes it with new ones, giving the skin a radiant glow. It improves the skin elasticity. Thus it refreshes the skin and makes it vibrant and young looking. It clears dark spots, discolored and pigmented skin and brightens skin tone. It gives nourishment to skin and also moisturizes, soothes and softens your skin. Rejuvenating Cream is a rich moisturizer formulated by Kai German Products an ISO 9001:2008 Certified Company in partner with Hawaiian Herbals, USA to address the special needs of dry skin. Kai Rejuvenating Cream drenches skin in soothing moisture, improving the skin’s moisture-binding capabilities with the hydrating power of Hyaluronic acid. A blend of emollients, humectants, and vitamins not only hydrates and nourishes your skin, but also helps keep dryness from returning for a more youthful looking complexion. It is an effective product for men and women ages 30+ with dry skin. It is a moisturizing compound found naturally in the skin; capable of binding moisture to the skin’s surface. It binds water to the skin to help maintain an optimal moisture level. Apply evenly on face and neck with fingertips, avoiding eyes and lips after cleansing the face. For better results apply 30 minutes before going to bed. Aloe Vera is known for its many healing properties. It is rich in enzymes, polysaccharides and nutrients which exhibit antibacterial and antifungal action. A natural UV inhibitor, it’s hydrating, softening and intense moisturizing properties nourish the skin. Winter Cherry is an effective anti-stress agent that has a mild tranquilizing action. In skincare, this plant is used for its antioxidant properties, which help skin cell regeneration. Indian Kino Tree grows in the hilly regions of India. Its astringent properties work as a skin tonic to tone and rejuvenate facial skin. Apply Nourishing Skin Cream gently over face and neck in circular motion twice daily, after cleansing. For best results, use regularly. Our skin faces various issues, like sagging, fine lines, wrinkles and age spots for mature skin and acne and acne spots for oily skin. These are the signs of unhealthy skin. Ordinary skin creams work superficially, only Kai Nourishing Range has a unique mask for intensive nourishment for skin. Kai German Products in partner with Hawaiian Herbals, USA launched a new product Kai Age Renew 5 Cream which helps in removing 5 early signs of ageing -- fine lines, loose skin, age spots, dryness and uneven skin texture. Clean the face and neck thoroughly. Apply Age Renew 5 Cream all over the face and neck using an upward circular motion, twice a day. For best results, use regularly. Dark, patchy skin and blemishes are signal of deterioration of skin health. Ordinary creams leave a white layer. But Kai Fairness Range works from within and nourishes your skin with every use, to give fair, even tone, and a blemish-free face that glows with health. Kai Complete Fairness Cream presents an alternate way to fairness. With unique Ayurvedic ingredients, it works on the inner layers of the skin, making it lighter, nourishing it with every use to give complete fairness that glows from within. Kai Complete Fairness Cream is enriched with wonderful ingredients Javetri, Kasturimanjal, Kesar (Saffron) &Raktachandan (Red sandalwood) which provide an intense nourishment dose for light radiant, healthy face. Saffron is a luxurious herb that has been used in skin care for centuries for a fairer and brighter complexion. Saffron keeps the skin moisturized and smooth. Crocin and Crocetin present in Saffron help to enhance the complexion and lighten skin. Raktachandan helps give softness to the skin can be used to get glowing, even skin tone and flawless complexion. It is also very beneficial for oily skin as it can help reduce oiliness from skin. It can also be used to reduce wrinkles and acne. Clean the face and neck thoroughly. Apply Complete Fairness Cream all over the face and neck using an upward circular motion, twice a day. For best results, use regularly.